The content of this article provides interesting history, facts and information about the Emperor Pertinax and the all-powerful Caesars who ruled the empire of Ancient Rome. "The Emperor who enjoyed the simple life but was murdered by the Praetorian guard"
Short Biography profile and facts about one of the most famous Romans of all, in the life of Pertinax, Emperor of Rome and provinces of the Roman Empire. Obtain a fast overview of the times of the Roman Emperor Pertinax from the following facts and information about his life. Pertinax was an aging senator of consular rank and now Prefect of the city of Rome. He was approached by the conspirators who were responsible the murder of Commodus to take over as Emperor. Pertinax was one of the few friends and ministers of Marcus Aurelius who had survived, and, having filled many important offices, had always been distinguished for firmness, prudence and integrity. The rumor was spread that Commodus had died of apoplexy, and that Pertinax had succeeded him; but the Praetorian Guards were dissatisfied at his election. The Senate, however, confirmed the choice of the conspirators and Pertinax but reigned with limited authority. His manners were simple, his mode of life frugal and he sought to revive the pleasing simplicity of the early Republic. Pertinax administered justice with strictness, released those who had been left in prison by Commodus, reformed the finances and introduced economy, re-dividing the uncultivated lands among those who would farm them, removed oppressive restrictions upon trade and earned the respect of some of his subjects. However, the Praetorians were never reconciled to his rule, and on the 28th of March, A.D. 193, eighty-six days after his election, they broke into the imperial palace, and struck down the emperor with innumerable blows. 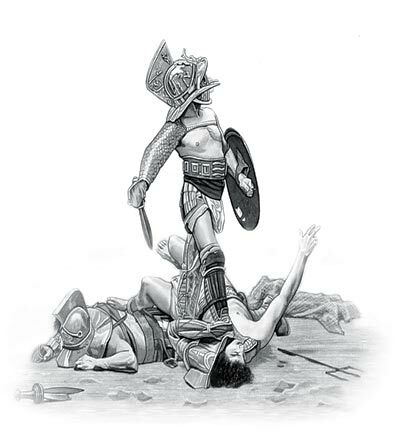 His head was separated from his body, and, being placed upon a lance, was carried in triumph to the Praetorian camp. A wealthy senator called Didius Julianus paid to become the next emperor. The content of this Pertinax category in the Emperors of Ancient Rome provides free educational details, facts and information for reference and research for schools, colleges and homework. Refer to the Colosseum Sitemap for a comprehensive search on interesting different categories containing the history, facts and information about the lives and people of Ancient Rome.